A special menu featuring TACOS and MARGARITAS will be offered. The price is $15 for members and $25 for non-members. SFPA looks forward to seeing you there. To register and to learn more about FAPA's 12th Annual Paralegal Seminar "Paralegals Holding It All Together", click here. 22 Jan 2019 SFPA 2019 CLE luncheon series presents "Being An Ally in the Fight for Equality" with speaker Melba Pearson, Esq. 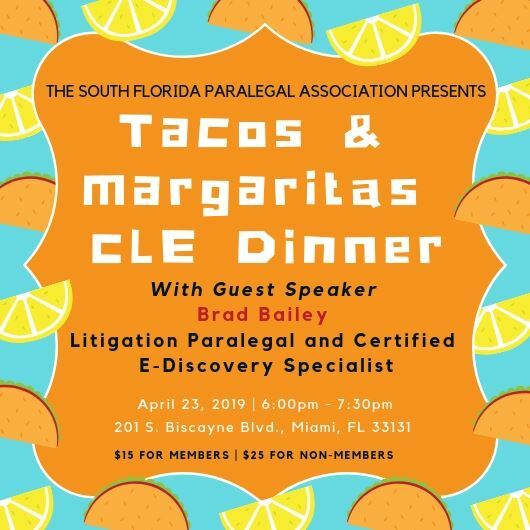 07 Oct 2017 Fall Seminar - 1st Joint Event with Florida Alliance of Paralegal Associations, Inc.
23 Aug 2012 BROWARD: SFPA CLE Luncheon August 2012: Social Media: The New “Face”book of E-Discovery, Speaker: Aldo Leiva, Esq. 12 Feb 2012 Band Together for Legal Aid - "Battle of the Bands"
11 Oct 2011 SFPA CLE Luncheon October 2011: Criminal and Civil Appeals - What's the Difference? 23 Aug 2011 SFPA CLE Luncheon August 2011: Criminal and Civil Appeals - What's the Difference? 31 Dec 2010 SELF-STUDY CLE COURSE: Preparing for an Administrative Hearing... How Similar is it to Preparing for a Trial? 27 Jul 2010 SFPA CLE Luncheon July 2010: Preparing for an Administrative Hearing... How Similar is it to Preparing for a Trial? 10 Dec 2009 SFPA Holiday & 30th Anniversary Celebration! 27 Feb 2008 SFPA CLE Luncheon February 2008: Rule 20: How Will It Affect the Florida Paralegal Profession?